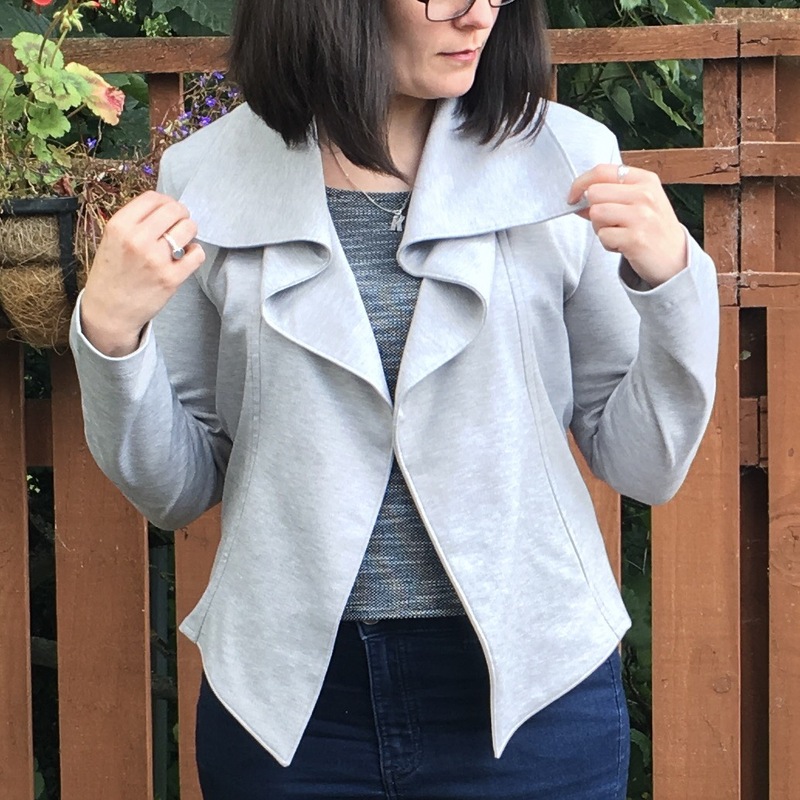 A while ago Kennis at Itch to Stitch put out feelers to see if anyone wanted to test her upcoming pattern called the Hvar Jacket. 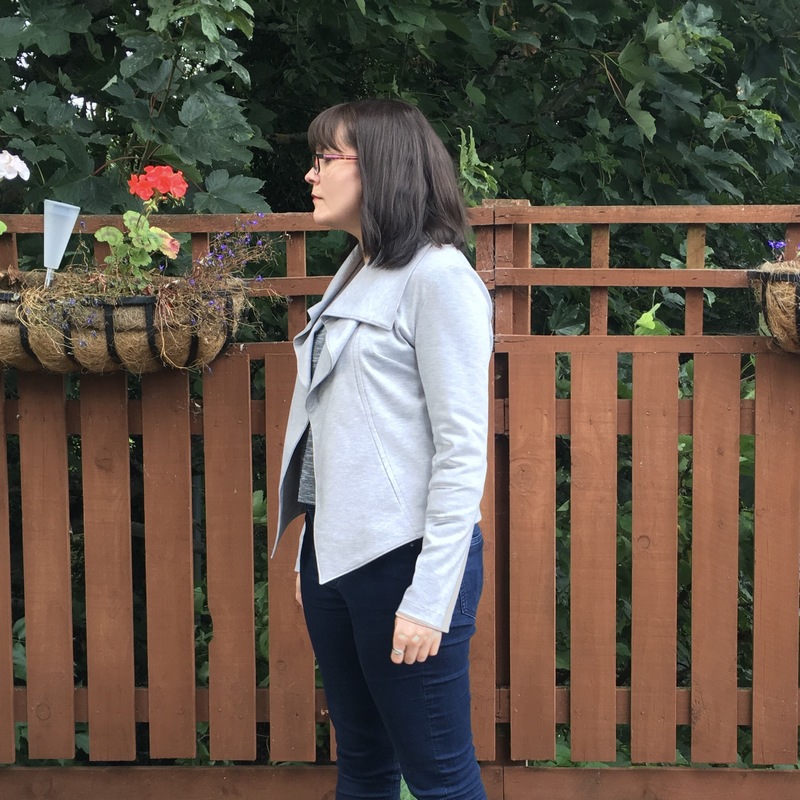 It’s a lightweight woven jacket pattern, unlined, with a gorgeous waterfall collar. I figured, hey, couldn’t hurt to put my name down… I liked the pattern and had a possible fabric in mind. And wouldn’t you know it! She picked me for the testing group! Now before I get onto the pattern I just want to say that the whole testing experience was just fun. Kennis started a closed Facebook page so all of the testers could post questions, photos, drool over each other’s jackets. It was just good craic. 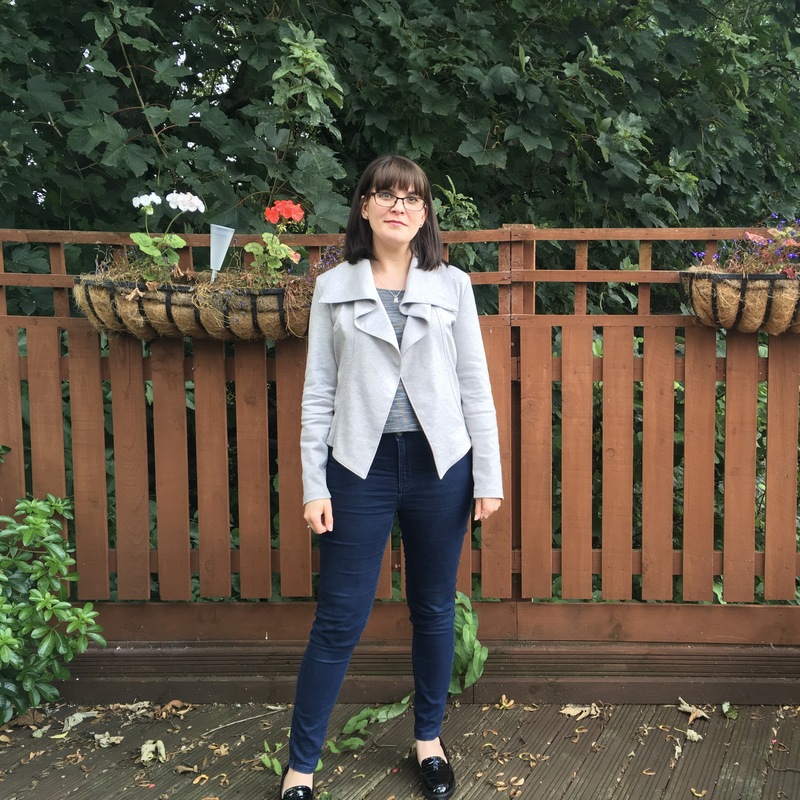 I was awkward of course… what I saw in this jacket was actually a very smart cosy cardi-jacket so I opted to make mine from a minimal stretch grey ponte jersey. Kennis had asked us to just make the pattern as-is without tweaks or hacks… just any usual fitting adjustments we would normally make (for wide shoulders and the like). I just made this up straight from the pattern to fit a 34″ bust. 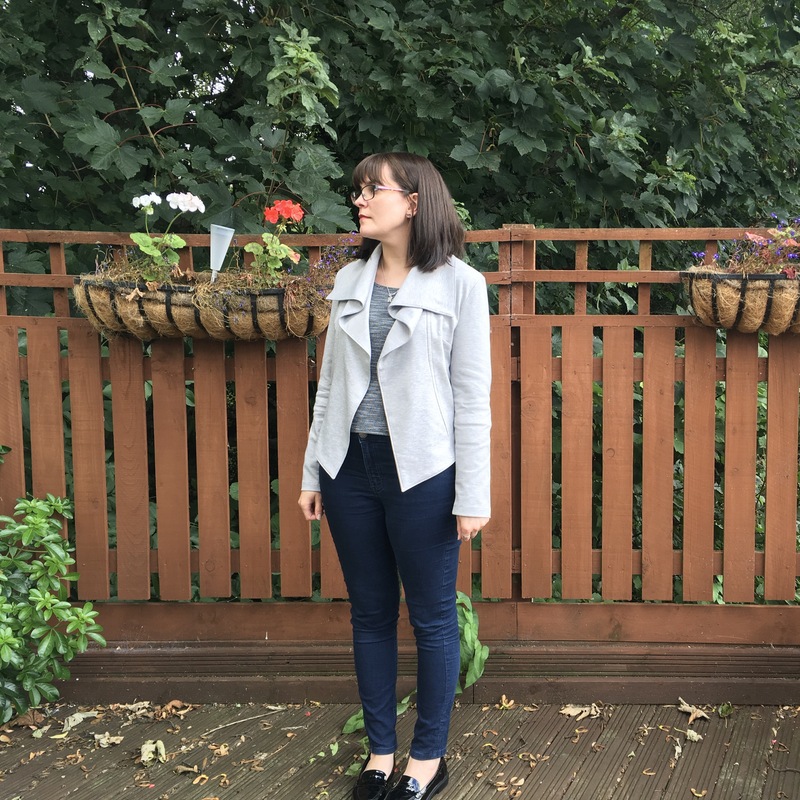 I would normally scale out a size at the hips but the style of the jacket didn’t seem to warrant that. The whole thing is just a handful of pattern pieces, and I must say the collar is attached, and lined, it quite an ingenious way which made it super easy to put together. I think once I’d stuck the PDF pieces together and cut it out I was at the sewing machine for a grand total of 2 hours… I know, such a hardship! I think if I did this in a woven (and oh yes I do want it in a woven) I would do the recommended bias binding Hong Kong finish. But as this is ponte I went without. 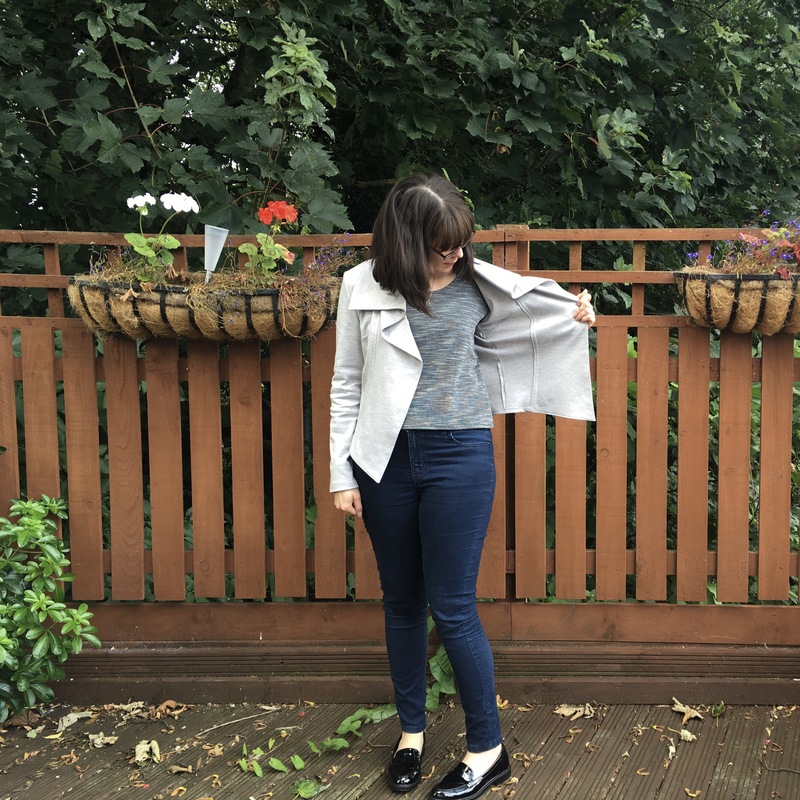 The front hem has a lovely dip to it which sets off the line of the collar and makes it look cute with pretty much anything you’d want to wear. The back on mine has some drag lines below the arms, but this was version 1 and Kennis has solved this for the final version. I may be tempted to lengthen the whole thing about 1.5″ just to get more bum coverage. This is a tweak I’ve added to other jackets and it’s just a personal preference. But I mean the big show stopper is that collar! This thing feels like a hug!! It really hangs gracefully and just naturally creates that satisfying ‘s’ on the front. On the whole I would highly recommend this pattern, the instructions were super clear and it was deceptively easy to put together. I’d also recommend you head over to Itch to Sitch to see the other ladies and their testers… Oof there are some pretty versions! And it really showcases the versatility. 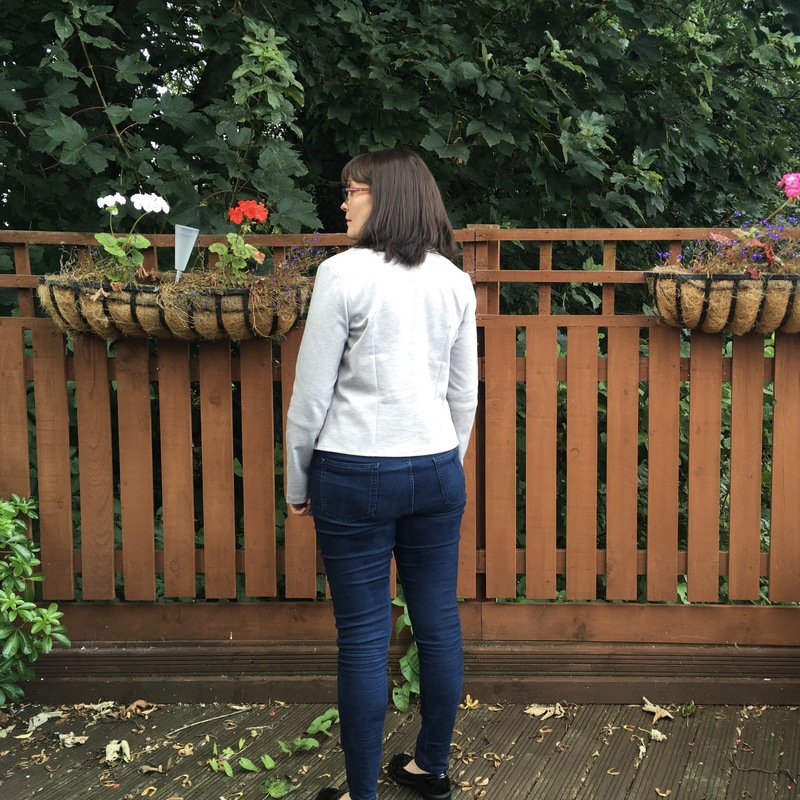 Sadly my only complaint is that it is a lightweight jacket… and we’ve just hit winter! I wonder how easy it would be to bulk up and line it? Just a final word to say I have no financial incentive to promote the pattern. Just me and my (usually very enthusiastic) honest opinion. But Kennis does have a sale on at the moment… just sayin. Next Post A new baby you say?